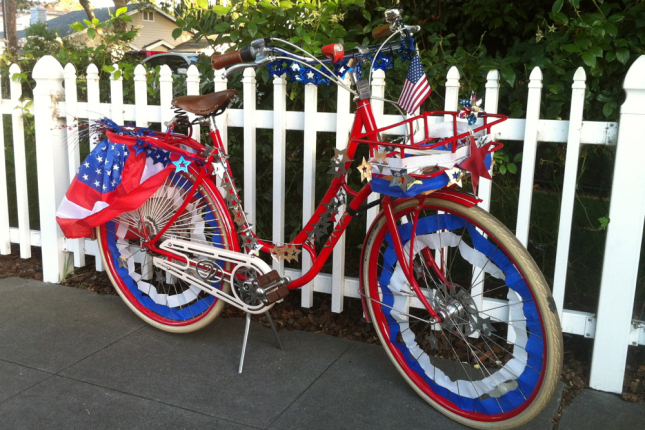 One of the very best ways to celebrate the 4th of July in Provo is by bicycle! Here are a few things you’ll need to know to get the most out of your patriotic holiday while on two wheels instead of four. (Details and times on the included links). Head over to the Moth & the Flame Concert by bike this weekend…free music, free t-shirts, free bike valet, and lots of fun. We had more cyclists park their bikes with the Rooftop Concert bike valet than EVER at the last show! Thanks to Mad Dog Cycles and the Provo Bicycle Collective for all they do to make it easy and safe for you to ride over from within town or leave your bikes after bringing them down from SLC on the FrontRunner. The air is gnarly this week and Downtown Provo will be super busy on Friday. No better way to make your way down here than on two wheels. Mad Dog will be hosting FREE valet service AND Safety Checks for your bikes. Skip the traffic, this is absolutely the best way to get to and from the concert. As if this night of revelry couldn’t get more exciting, join in on the annual July 3rd Glow-in-the-Dark Ride. Every year, dozens of brightly lit cyclists ride around the parade route enjoying the spectacle and delighting the crowds. It’s not to be missed. You’ll definitely want to come to Provo’s Grand Parade on Saturday morning. Bikes are your best way to beat the crowded traffic. Plus, for the first time every, our mayor will be riding a bike in the parade. He’s also invited a few members of the Provo Bicycle Committee to ride along. So expect to see penny farthings, high wheelers, tandem trikes, bucket bikes, and more. Remember, traffic isn’t going to be so fun this holiday. But, bikes will be. Consider picking up some red, ride, and blue streamers from the dollar store and ride in style. Happy Independence Day!